Good Friends, Good Food, Great Holiday! My trip to Umbria, Italy lasted only about a week; and I never even had to get out of bed. It was a wonderful journey as I followed Nancy Yuktonis Solak on her year-long vacation to the center of that passionate and romantic land. Her lovely book, “A Footpath in Umbria” is peppered with pictures of the spirited ebullient people she met and of the historic places she and her husband had visited. Her day-to-day experiences were so much fun to read about as she and her husband took long walks meandering around the city, having dinner with friends and neighbors, imbibing in a little wine, and sharing in long leisurely conversations with the locals. It seemed no matter whom they met—everyone turned out to be a friend welcoming them into their homes and families. She shared bits and pieces of Italian culture and noted the differences between theirs and ours. There were visits to the library, markets, and the different Internet cafes available where she could catch up on e-mails and phone home. It was interesting to note the hearty stock that Italians are and how they brave the cold weather; even in the dead of winter no one had a cold over there. The only thing I didn’t like . . . my adventure is now over; the house seems a little more quiet and empty than it did before I picked up this book. But, now I know, if I ever want to return to visit with Nancy or the people of Umbria, it is just a bookshelf away. I’d like to thank the author for this beautiful copy of “A Footpath in Umbria”, and also to Review the Book.com for the opportunity to review this book. 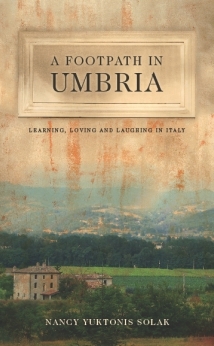 This entry was posted in BOOK REVIEWS, POSTS and tagged Italy, Nonfiction, Travel, Umbria. Bookmark the permalink.